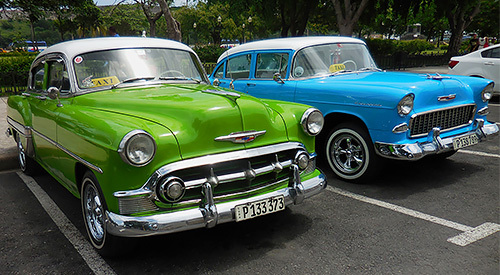 Visiting Cuba is like opening a time capsule into a bygone era. This applies both to the topside experience, and the marine enviroment. On arrival in Havana my first impression was of an old-world airport, very nearly overwhelmed. Outdated infrastructures are struggling to handle an escalating influx of tourism from around the world, finally again including visitors from the USA. On the private bus to downtown Havana we passed miles of colonial architecture in various stages of decline. Driving along the famous Malecon, a row of once proud villas, some now crumbling, face the Bay of Havana and a rapidly changing world. In juxtaposition, our hotel was an oasis of air-conditioned luxury, spacious lodging, and fine dining. One could easily settle in at the ornate mahogany bar and enjoy hand-crafted mojitos while puffing on a big Cohiba cigar. By the third drink, you might start thinking you knew Cuba. But to begin to understand this unique country and its place in the contemporary world, one must go beyond superficial impressions, put aside preconceived notions, and step out into the streets to meet and converse with the Cuban people. Both English and Spanish are spoken. Though still honored, Fidel is an old man very slowly fading away. Private enterprise is on the rise. Communism and socialism are trending towards nascent capitalism. 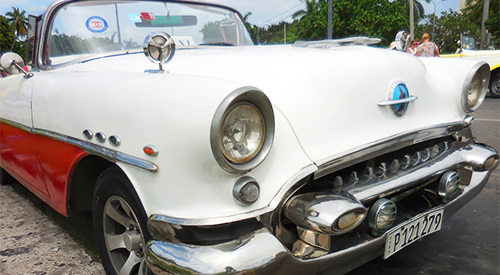 The automobiles may be classic, but ideas and attitudes in Cuba are modernizing. Our guide described the society as a child beginning to walk. From what I could discern after my first brief visit, many of those "children" are striving to walk briskly into the future with new-found optimism and enthusiasm. How much longer will this society remain frozen in time? FIRST NIGHT IN HAVANA - On our first evening in Havana our group walked from our Parque Central (Central Park) Hotel to a nearby private restaurant hosted in one of those lovely colonial homes. We strolled past the Museo de Bellas Artes (Fine Arts Museum), and then a Museum of the Revolution beside which is enshrined the historic "Granma," the yacht that Fidel sailed from Mexico to Cuba to begin the revolution. It was surrounded by a display of historic, and antiquated, military equipment. Commencing with mojitos at the restaurant, our dinner conversation was boisterous as the group began to meet one another, and pepper the guide with questions. 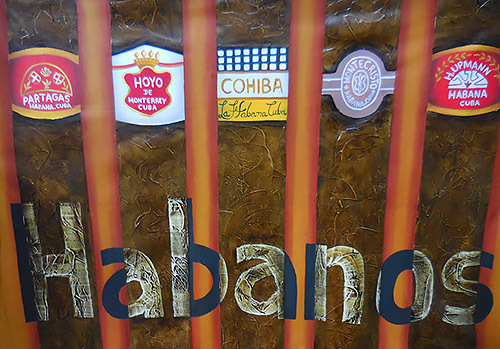 The multi-course meal was satisfying, but our desire to learn more about Cuba was just dawning. 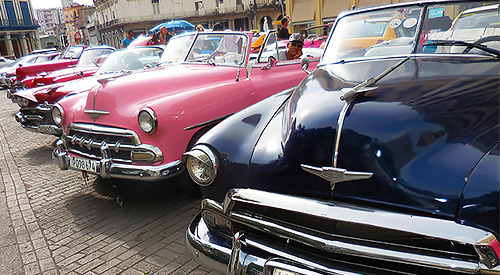 HAVANA TOURING - The time had finally come to resolve all those decades of anticipation and conjecture. 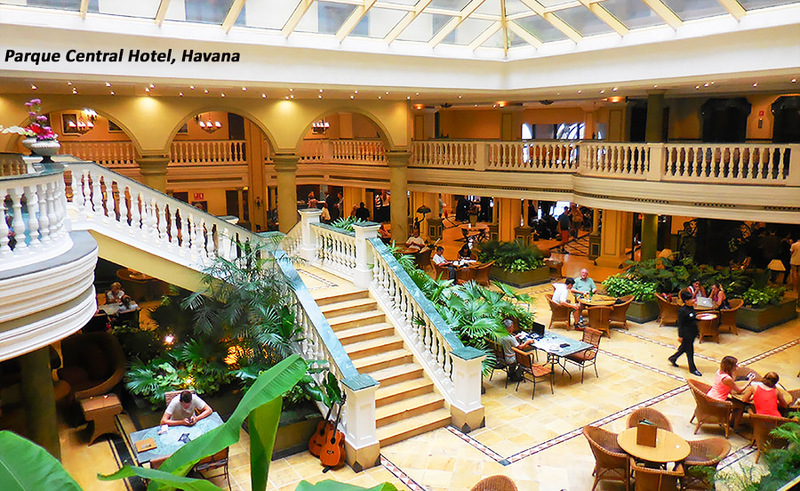 Up nice and early, our lodging in the luxury Parque Central included a stupendous breakfast buffet and multiple cups of excellent Cuban café con leche. Next on our agenda was an orientation for the diving we would soon be experiencing at Gardens of the Queen. We met in the lobby at 9 am and were taken to a modern conference room at the second floor Business Center. 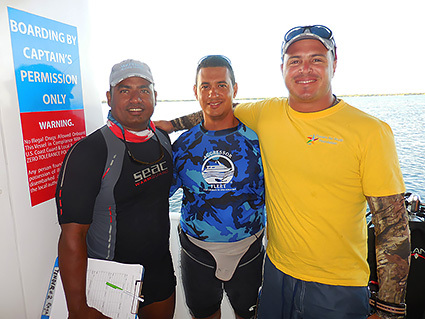 MARINE BIOLOGY BRIEFING - Dr. Julio Baisre of the Marine Fisheries Department gave us a very welcome and comprehensive briefing of the Cuban marine ecosystem, and showed us underwater photos from Jardines de la Reina, the archipelago where we will be diving. We learned that "Jardines de la Reina," in English "Gardens of the Queen," was name by Christopher Columbus in 1494. Among other things, he reported high concentrations of flamingoes and sea turtles. In the 20th Century, this same place was Fidel Castro's private dive site. 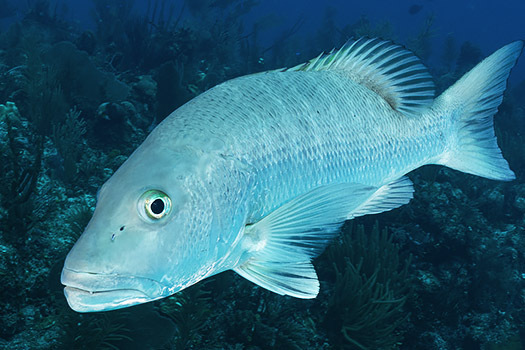 Located far from development, and 55 miles offshore, exploitation of the marine resources at the Gardens have been limited. 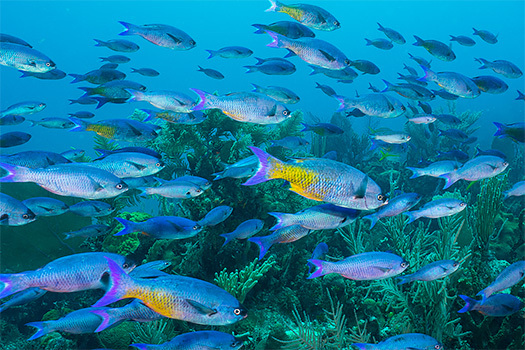 In 1996 Cuba updated its Fishery Law, one outcome of which was the creation of the Gardens of the Queen Marine Park. Our visit in 2016 marked the 20th anniversary of that preservation effort. MORNING TOUR - Following our lecture, we departed our hotel by bus and headed down the historic Paseo del Prado to the Malecon, the iconic sea wall that faces the Bay of Havana. Across the water we saw El Moro Fort and San Carlos del la Cabana Fort, both originally built to defend Havana against pirates. Parts of the ancient stone walls that once encircled the city are still visible. We drove past Che Guevara's house and the immense Statue of Christ of Havana, gawking at 1950's cars, pedicabs, and horse carts. The remainder of our morning was devoted to a walking tour through some of Old Havana's most celebrated places, Plaza de San Francisco, Plaza de las Armas, and Cathedral Square. The old city holds a fascinating mix of colonial period architecture, some carefully renovated, other buildings in various stages of decline. Throughout the walk we were visited by a moveable feast of hawkers, street musicians, period actors, peanut salesmen, book sellers, and assorted other vendors. I enjoyed the interaction, and wonderful photo ops, but if you prefer simply say "No, gracias," and keep on walking. Just as our energies were flagging we rejoined our tourist bus for the short drive to the Atelier Restaurant, and a cool, calm and refreshing lunch. AFTERNOON TOUR - Suitably rejuvenated, our afternoon tour had us back on the bus to visit the Plaza de la Revolución, both historic forts, and a government sanctioned store that sells premium coffee, cigars and rum. The wide-ranging tour finished with a shopping foray to a sprawling and immensely colorful artisans' market packed with all manner of paintings, carvings and handicrafts. Sitting in a plastic chair at a tiny café in the market, I looked up to see that I was enjoying my demitasse of espresso under the iconic gazes of Ernest, Che, and Charlie. By the end of this eye-opening day we had the beginning of an understanding of the layout of old Havana. Back to the hotel in time for a shower and a bit of a rest, our evening was capped with a superb dinner at Litoral; what we were told was the best restaurant in Havana. After a superb meal featuring a very creative salad bar, we were left with all reason to believe it to be so. CAFFEINE FANS - Allow me to suggest that you be a tad cautious of all those tempting offers of Cuban coffee. It is excellent, and the espresso cups are deceptively diminutive, but the net effect left me wide awake until after 3 am. Oh well...I spent the time savoring the experiences of our first immensely satisfying, and eye-opening day in Havana. ROAD TRIP - Following check out and an early breakfast, we were in the hotel lobby by 7:30 am, ready for our six-hour transfer to the central south coast of Cuba to join the Jardines Aggressor. If Havana felt 50-years back in time, the countryside through which we passed, and the few small farming towns, made it feel like 100 years had been stripped away. For the most part the roads were good, lined by boundless fields of sugarcane, dense plantings of banana, and tall coconut palms. Cattle grazed in fields of grass almost as tall as the animals, while water buffalo wallowed in deep mud pits. Passing through the small settlements, the view included big mango trees, breadfruit, almond, guava, and papayas. Rustic wooden horse carts replaced classic cars as the primary means of transport. Accentuating the cultural and temporal divide, our own travel was in a comfortable, air-conditioned bus. With two stops along the way to stretch our legs, and naps in between, it was a pleasant and visually revealing journey. MONEY, HONEY - Bring cash money to Cuba. U.S. credit cards are not accepted. If you are on the Jardines Aggressor program, I suggest that you bring a minimum of $500-$1000 in cash USD. You most probably won't spend all that, but it's good to be prepared for contingencies. Bring this in clean, modern issue $100 and $50 bills. At the hotel change $50 or $100 into C.U.C. Pronounced "cook," this is Cuba's convertible currency designed specifically for tourism. The exchange rate, artificially set by the Cuban government, was $100 USD = 87.50 CUC. 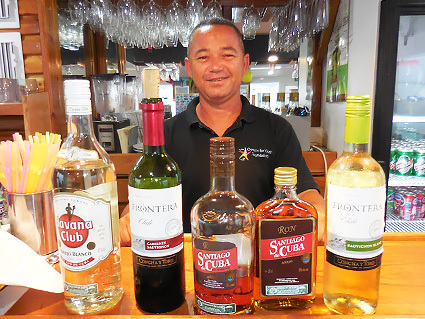 This currency will allow you to purchase water, coffee, bar drinks, cigars, rum, and souvenirs. If you'd care to enhance the local economy, be sure to stock up on small denomination coins, these to offer to the ubiquitous street musicians, period-dressed actors, and classic car owners who inhabit the tourist areas. If you take a picture, they will expect a tip. Leave a tip in CUC for your barman, maid and bellmen at the hotel, and budget your dollars for the tip when you disembark Jardines Aggressor. 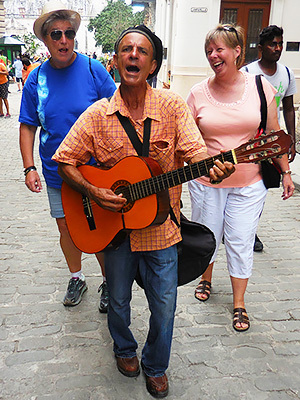 TOURISM ECONOMY - The average salary for a Cuban worker is the equivalent of $20-50 USD per month. It takes 25 of the local Cuban pesos to equal one CUC. 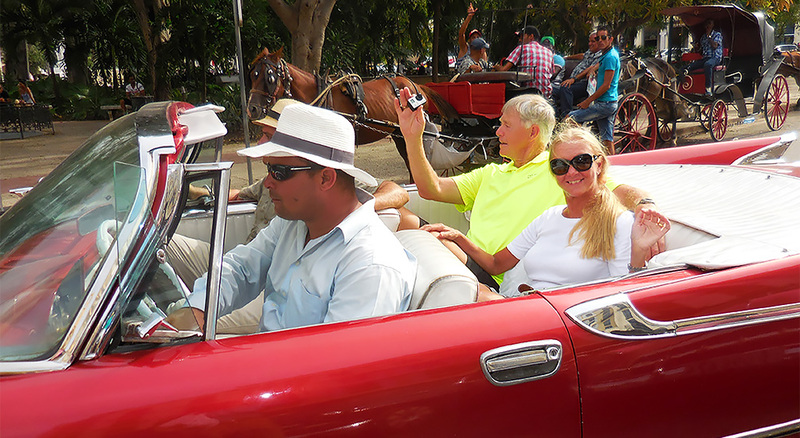 Thus it becomes evident that certain of the Cubans working in tourism have some of the best jobs in the country. Private restaurants, classic car taxis, tour guides, bus drivers, street performers, scuba diving guides, and others who receive payment or tips in CUC or foreign currency have the opportunity to get ahead. As a result, many tourism jobs are taken by college educated people, and especially those who have gained foreign language expertise. 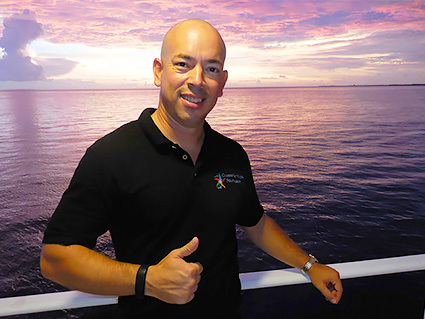 I'm pretty sure that our knowledgeable and well-spoken tour guide, who used to be a history teacher, now earns appreciably more than a typical Cuban doctor or college professor. ELECTRICITY - Standard electricity in Cuba is 115 volts, same as in USA, but you may encounter two different kinds of sockets and plugs. 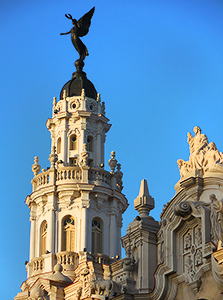 In Havana, the receptacles take a plug with two round pins. Be sure to bring an adapter so you can charge your phone, camera, etc. On the Jardines Aggressor, plugs are typical USA-style double flat prong, but power taps are in rather short supply. Thus for the liveaboard, you might want to include in your packing a small power strip or multi-plug. INTERNET and TELEPHONE ACCESS - Internet is not yet widely available in Cuba, though there are a few areas in Havana that have hot spots for locals to use. Our upscale hotel, the Parque Cenral, had a pretty good internet connection, though it required that I purchase a card at the business center. One hour of access for two CUC was not unreasonable. I soon found that Skype does not work in Cuba. It is blocked by the U.S. government. By way of substitute, Facebook Messenger worked just fine. As to cell phones, my AT&T iPhone had no signal anywhere in Cuba. It became nothing more than a fancy alarm clock. People with Verizon reported that they did have a signal, and were able to send text messages. Phone access may improve as contracts and technologies are updated. JARDINES AGGRESSOR I and II - Typical of the original Aggressor Fleet vessels, these two liveaboard dive boats began as just the steel hull of an American offshore crew boat, then rebuilt from the hull up. The finished products are comfortable and serviceable, though perhaps not quite as deluxe as some other modern liveaboards. All but two of the guest cabins are below decks, each with ensuite toilet and shower. The cabins are not overly large, but very comfortable. Beds are raised platforms, allowing ample storage below. 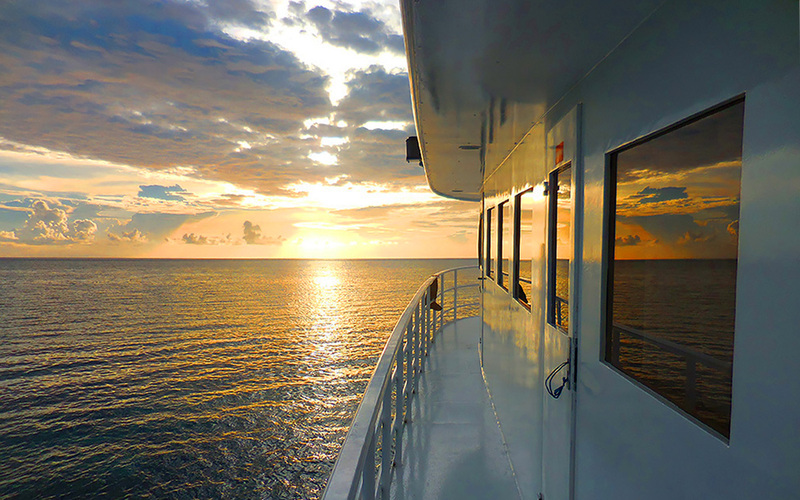 The main deck has an air-conditioned salon forward, and the dive deck astern. One level above is the dining area, also air-conditioned, plus a nice outdoor area over the stern that includes a hot tub. Guest complement on the Jardines Aggressor I is 20, with a crew of 14. the Jardines Aggressor II takes 24 guests, with a crew of 16. Diving is done from two Fiberglas tender boats with twin 150 h.p. Yamaha engines. 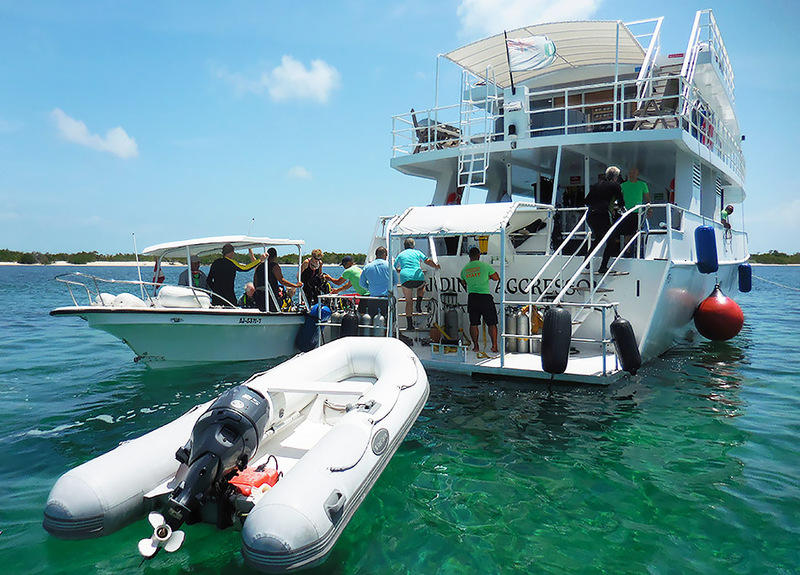 Each boat accommodates ten divers, plus driver and two dive guides. Once set up, our main dive gear stayed on the tender, and tanks are refilled in place. Nitrox fills and analyzing were well organized. AWESOME CREW - I can't say enough about how fine a crew we were so fortunate to sail with. Everyone was certainly very capable in their roles, but more importantly did their work with great enthusiasm and humor. The food was good and the service in the dining room superb. The boat drivers and dive guides were top notch and really wanted us to see and do it all. At the end of every dive, once out of our wet suits, we'd make use of the two hot showers on the stern swim platform. Following shower, the cry of "hot towels" was raised, and with great ceremony we'd be draped in an extra-large towel right out of the dryer. To improve on that further, at the end of the night dives, after receiving our hot towels, they poured us big cups of hot chocolate topped with a generous serving of dark Cuban rum. Now that is service. 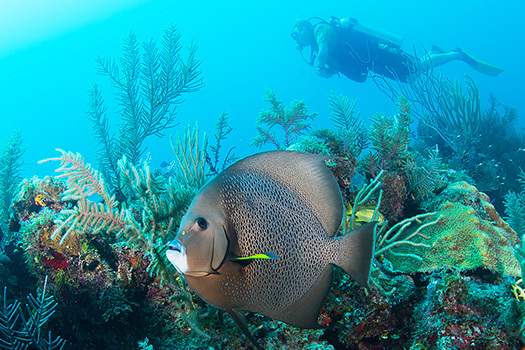 JARDINES de la REINA / GARDENS of the QUEEN - This is Caribbean diving, so don't expect Pacific Ocean marine life diversity. That said, the Gulf of Ana Maria and Gardens of the Queen are a very unique ecosystem. 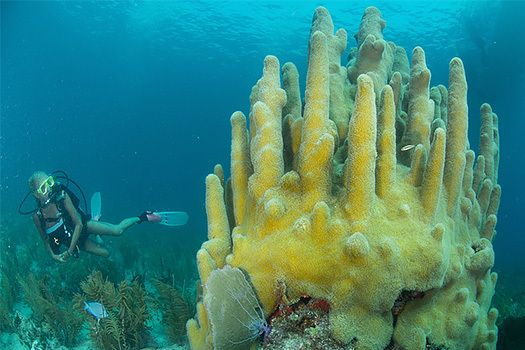 The diving is around a barrier reef and extensive mangrove system a full 55 miles offshore. As a result, local fishing pressure is light to nil. 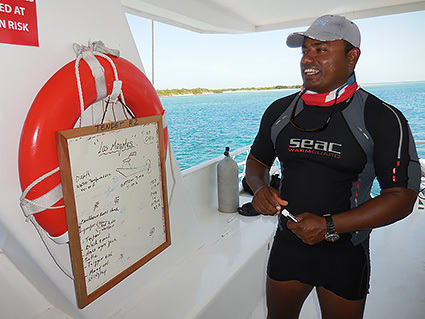 Diving there is limited to the Jardines Agressor and two other liveaboards operated by its mother company, Avalon. There are no land-based resorts in Gardens of the Queen, and in fact virtually no human habitation. But the Jardines Aggressor II is already being built, and no doubt that more divers are on the way, so come soon and beat the crowd. GOLIATH GROUPER - The result of this minimal pressure is a remarkable fish population. My group included a small cadre of dedicated REEF fish counters. Working together, in six days of diving they identified 157 species, from tiny gobies to seven-foot-long sharks and so much in between. For at least the past 20 years, divers have been asking "Where have all the big fish gone?" Well now we know they have been hiding out at Gardens of the Queen, Cuba. I was delighted by the variety and density of big fishes. 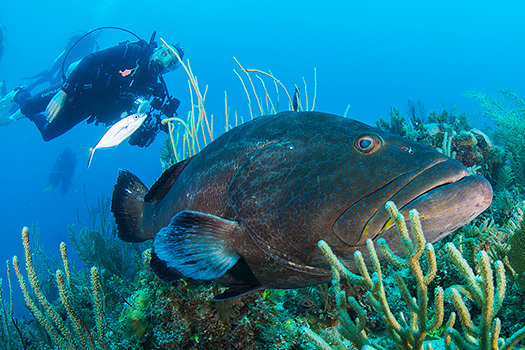 On most dives we were greeted by large Nassau grouper that followed along like labrador retrievers. Black grouper and tiger grouper were common sights. 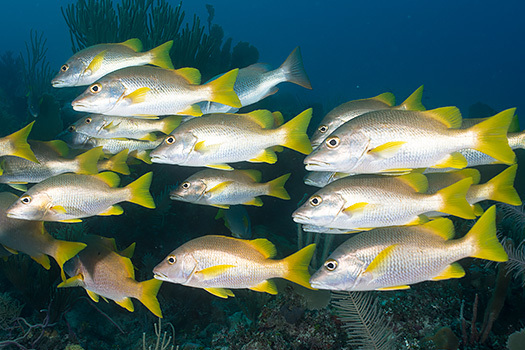 Hunting dog-tooth and cubera snapper swirled around the margins, while schools of smaller yellow snapper or school masters often congregated in the hundreds. Along with turtles, angelfish, queen trigger fish, Spanish hogfish, and countless butterfly and damsel fishes, in just six days of diving we saw four different Goliath grouper. When compared to today's highly exploited Caribbean reefs, it is wonderful to see that the Cuba time capsule also applies to the marine life at Gardens of the Queen. 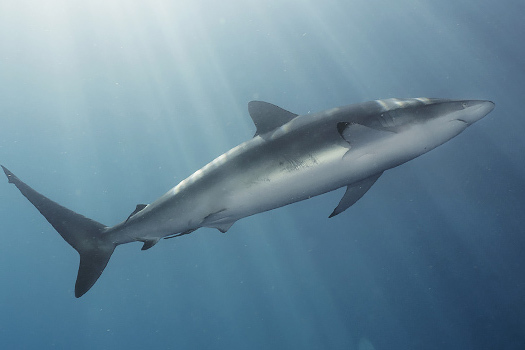 LET'S TALK ABOUT SHARKS - When you tell a non-diving friend you're back from a trip they have two questions. "How deep did you go?" and "Did you see any sharks." The best answer to the first question, courtesy of Dee Scarr, is "To the bottom!" And if you've just been to Gardens of the Queen, the answer to the second query is "Heck yeah!" We saw sharks on most every outing. 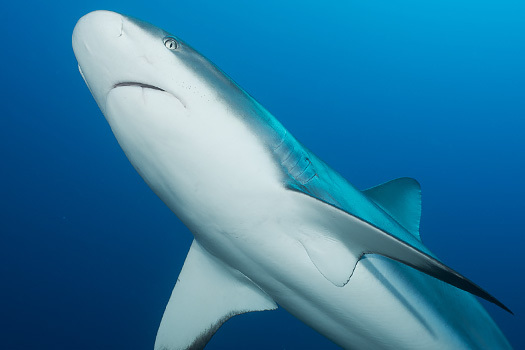 They were not fed during our dives, sharks are just part of the natural environment. 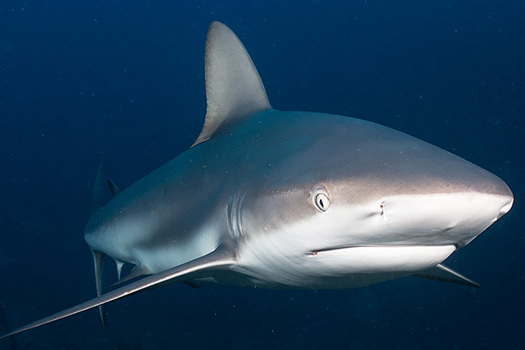 Gray reef sharks, silky sharks, and the occasional nurse shark were all common, and very welcome, sightings throughout our week of diving. 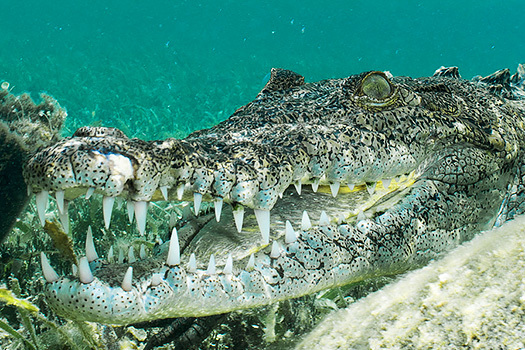 SMILE OF THE CROCODILE - Now that I've enticed you with shark encounters, let's consider the opportunity to swim side-by-side with saltwater crocodiles. 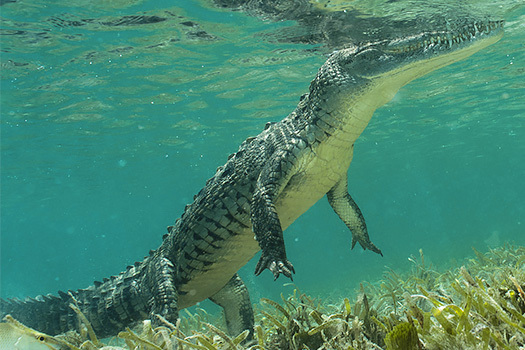 Don't worry, the crocs are not out on the reef, but they are a natural part of the mangrove marshes, so between dives we made a special trip to visit them. 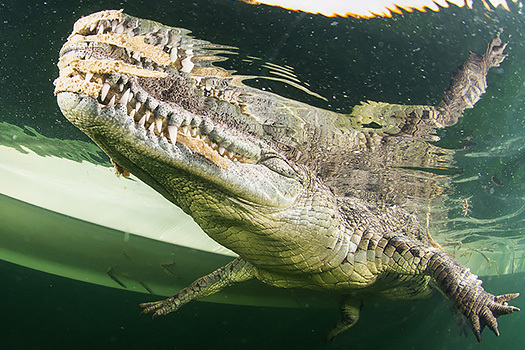 The guides refer to all these crocodiles as Niño (meaning boy), and because they bring offerings of raw fish or chicken, the crocs have learned to come to the guides shouts of "Niño!" Our first croc appeared from far back in the swamp, slowly swimming towards us with languid swishes of that powerful tail. It stopped about ten yards from the boat and would come no closer. Well I wanted to get some pictures, so with the guide's permission I slipped into the water and snorkeled over to introduce myself. As I've learned to do with all shy marine life, I approached slowly and obliquely, as non-threatening as possible. Initially the croc kept sliding away from me. I persevered, and as you may see from my images, it ended up as a face-to-face meeting. While you may prefer to watch from the boat, I enjoyed this so much that a dive buddy and I went back in the afternoon to find and photograph an even larger specimen. 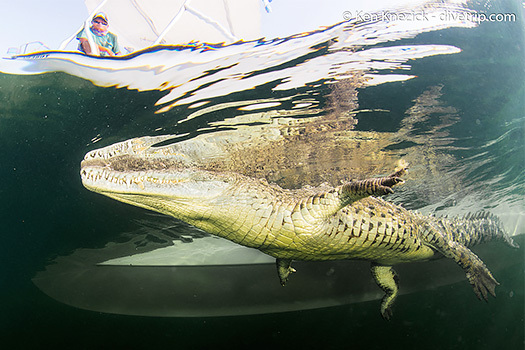 Check out the pictures...I think the second croc could have been Niño's dad! Note: The crocodile experience is purely optional. 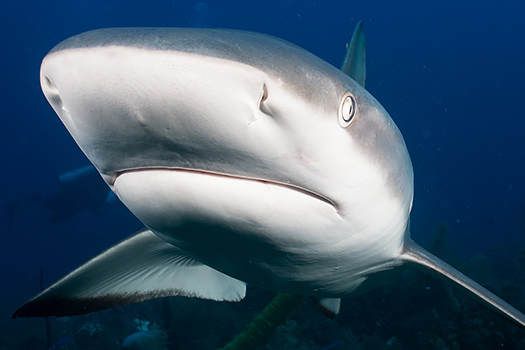 You do not have to get in the water with them, and you will not encounter these "smiles" on your reef dives. PEPE'S (Underwater) FARM - The final dive of our cruise was on a dive site called Pepe's Farm, and I left my camera on deck, the better to simply enjoy the experience. 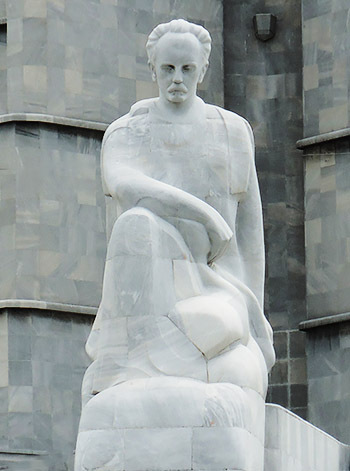 The site is named after the Italian man who started the Avalon diving business in Gardens of the Queen. As we first descended, the "crop" on the reef top of Pepe's Farm top was acres of lush sea fans waving in the gentle surge. 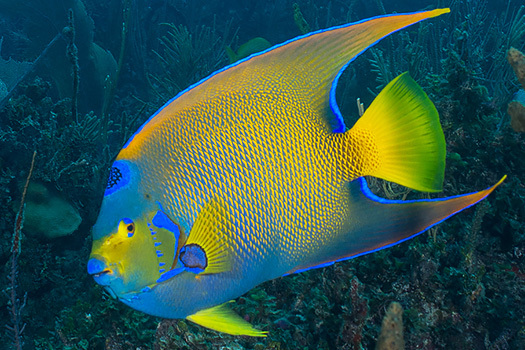 Swarms of yellow snapper and blue tang grazed among the swaying fronds. Moving to the reef crest I was joined by the resident grouper who followed along for the rest of dive. Our guide brought along a pole spear and kept an eye out for lion fish. 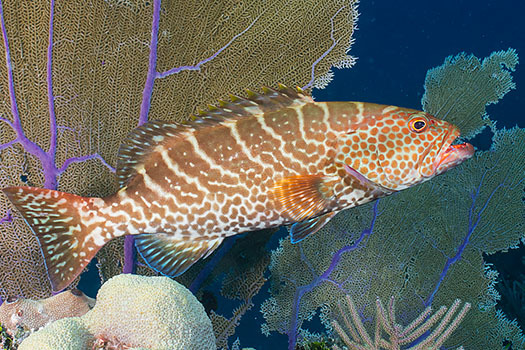 On this dive he fed lion fish to a moray eel, a Nassau grouper, a queen trigger, and a gray shark. The guests enjoyed the spectacle, and the juvenile fish on the reef certainly will benefit from the removal of those voracious hunters. For most of the dive I stayed just ahead of the group, peeking under ledges, seeing how close I could get to tiger grouper, enjoying the occasional turtle and reef shark fly-bys, doing my best to commune with this pastoral sea and revel in its bounty. As this final dive of our visit ticked past 70 minutes, it was clear that none of us wanted to leave. 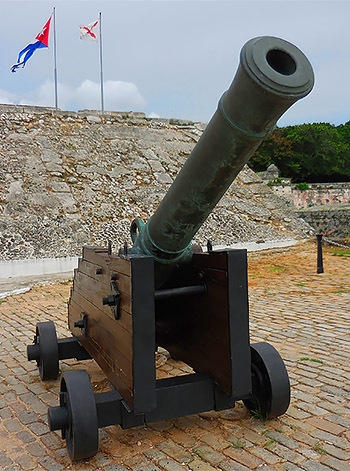 LOOKING TO THE FUTURE - Cuba, the largest island in the Caribbean, has had a unique history going back to the time of Christopher Columbus. In the 16th Century, the indigenous Caribbean Indians were turned into slaves by Spanish invaders, and pitilessly ground into oblivion. The Spaniards simply brought slaves from Africa to replace them. Nineteenth Century USA military might, amplified by Teddy Roosevelt's hubris, finally overcame the Spaniards thus enabling the biggest plantation owners, home-grown military dictators, and eventually the Mafia to become the predominant powers. In the 1950's, Fidel Castro raised a popular revolution, evicted those power elites, and promptly became a dictator himself. Propped up by the Soviet Union, Fidel's reign has lasted 57 years and still counting. 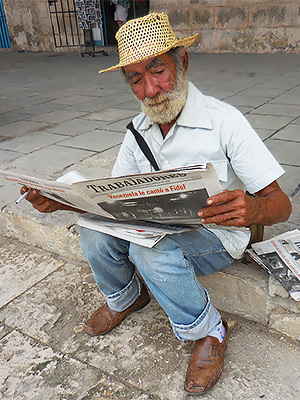 Once the Soviets fell behind economically, Castro and the Cubans found themselves on hard times, standing alone and empty-handed against the most powerful country in the world, looming just 90 miles to the north. Today, relations between USA and Cuba are finally thawing. The formerly forbidden fruit beckons, tourism from the USA is beginning to flow, and the all-powerful American dollar is again playing a major role. Will Cuba be able to honor its history and adhere to its own sovereignty against this coming wave of corporatism and potentially overwhelming capital? 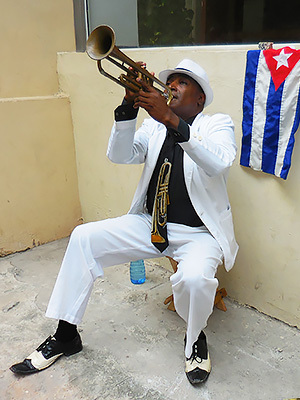 The Spaniards, the Africans, and many other cultures have grown together into a proud and homogenized Cuban people, but they are emerging quite late to the 21st Century. Once Fidel finally passes, how may the Cubans fare in their peculiarly brave new world as they taste increasing freedom, enhanced commerce, and the heady temptations of capitalism and democracy? In response to my persistent queries, our perceptive and quite candid Cuban guide expressed optimism. 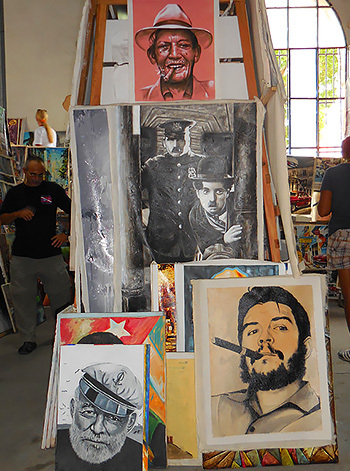 His contention was that the Cuban people have an ingrained culture of resistance that goes back centuries. As he put it, "We Cuban people are like our coffee. The cups are small, but you will see that we are very strong." 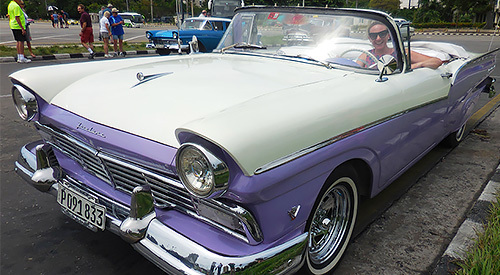 From Island Dreams' 2016 Cuba trip, read the: Guest Comments - Wow!